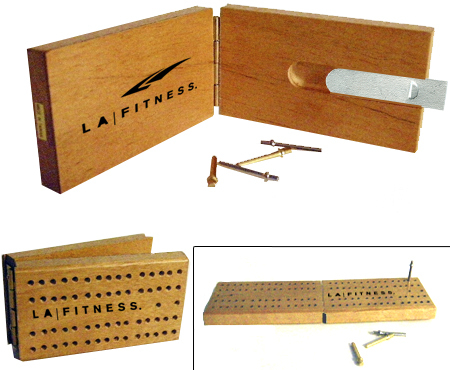 Our Custom Cribbage Games are beautifully crafted and come with the design of your choice imprinted either 1) on one side of the top of the board between the peg holes or 2) on one side of the inside of the game board. Your design is "fit-to-size" on the game surface for both imprinting options. Our Custom Cribbage Game Boards measure 3-11/16" Long x 2-1/6" Wide x 15/16" Thick when folded, and 7-1/4" Long by 2-1/16" Wide by 15/32" Thick when used in play.